I couldn’t think of a better way than to end the A to Z Challenge with a little-known, slightly mostly bizarre merknight called Zitiron. He’s an armored knight with a fish tail. 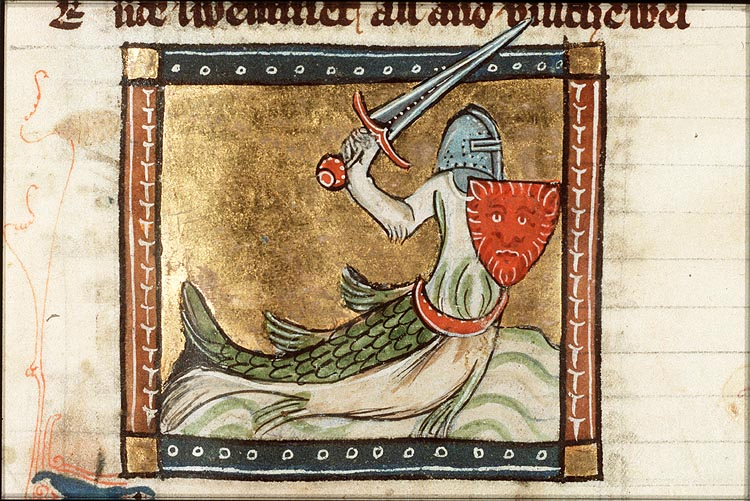 Armor is heavy, so I’m not sure how well he can swim and yield a sword. Zitiron has shown up in a few art pieces including the illuminated manuscript of Jacob van Maerlant‘s poem “Der Naturen Bloeme”, c. 1350 (shown). He shows up in Hieronymus Bosch’s really creepy painting The Garden of Earthly Delights from 1503. Bosch’s work is, um, disturbing, so I’m not even going to show the detail. It was worth mentioning the tiny zitiron knight swimming in the pond though. 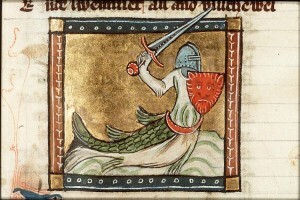 What kinds of quests would a merknight be sent on? 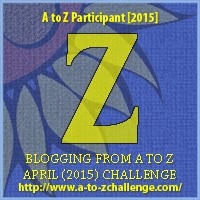 Which A to Z chimera creature was your favorite?